On January 24, 2013 at approximately 948am patrol responded to the Smithville CVS Pharmacy for an armed robbery. Store personnel advised a female entered the store walked to the pharmacy counter and demanded pills and money. The suspect displayed what appeared to be a handgun inside a plastic bag. She then fled the store. A search of the immediate area was conducted by arriving Patrol Officers, Detectives, and K9 (Ofc. Welsh and K9 Partner Titan). The track led to Waterview Dr. Building 21 where a suspect, who matched the description, was located and subsequently taken into custody by officers on scene without incident. Arrestee-Deborah Conover 48 year old female of Galloway Township was transported to the station where she was processed and charged with 3 counts of armed robbery, which include the robberies that occur in the same CVS store on 12/29/12 and 1/8/13. She was lodged in the Atlantic County Jail in default of $250,000 cash bail. 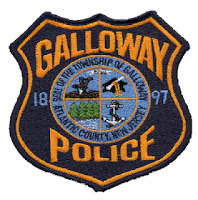 way to get these scumbags out of galloway and in jail way to go k9 team. The scumbag you're referring to happens to be someones child. She's another victim of addictive prescription drug use in our country. Thank God no one was hurt. Maybe now she can get the help she needs or would you rather see here put in jail for the rest of her life and forgotten about and writing off and labeled a scumbag. I personally think the store's manager and the police department are at fault for this THIRD robbery in ONE month. There should have been an officer or at the very least, a security guard, at that store from open until close. The guard for that store was not scheduled to come in until 2pm. Mind you, one of the other robberies occurred in the morning hours. I live in this area and frequent that CVS with my 5 year old. Not to mention the young staff members who have had to deal with this for the past month. Great job to the DOGS for finding the woman, but they should have brought them out one of the other TWO times. Ben, the "scumbag" that the previous individual was referring to is an absolute monster. How can you use their addiction as an excuse? Millions of people are addicts and they seek help or they continue to wallow in their (self imposed) misery. This animal chose to threaten the lives of innocents by brandishing a gun with threats of violence. That sir, is not the fault of addiction. I'm glad this heathen is off the streets and hopefully will rot in a tax funded cell for her remaining days. To the second and third and commenters: u guys got balls...this addict is lucky she didn't get caught in the act by an off duty's bullet. Go ahead and put someone's family along with innocent people in danger and pray it isn't near one. And if u liberals wanna play patty cakes with addiction excuses and rehab, why don't u blame the Dr's who go through 1 ink pen a week filling out scripts. Scumbag was the phrase used to describe the person, not the sentence you tool! Nothing was said against the rehab option or the perp being locked up for life! All in all, this is great police work, and you bashers need to appreciate a good thing when it's done...K9 tracks are no easy tasks!